It is with sadness, but a great appreciation for the fact that our mother, Elaine Sarah (Muise) Doucette left this life the same way she lived it - on the dance floor – at the age of 83 on February 10, 2019. 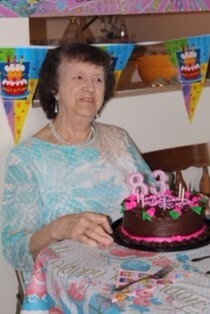 She was born in Kegeshook Lake (Quinan),NS, on June 24, 1935 to the late Albert and Elizabeth (Doucette) Muise and was the loving wife to her late husband George Doucette, who passed away in August of 2015. Elaine was a caregiver by trade and by nature. She worked caring for the elderly over the years, and greatly enjoyed her career. Her and her husband George raised 5 children together, and family was the absolute most important thing to her in this world. She enjoyed her time spent with her children and her grandchildren and made sure to over feed everyone who came over. Elaine was always surrounded by friends, even up until the day she died. She was very social and chatty, and the life of the party. She had moved from her parents’ house to living with her husband and after George passed away, she moved to the Loch Lomond Villa Apartments; her first place on her own. Even there she took care of her neighbours like she always had. She loved it when her daughter Gail would pull up in her blue Mustang Convertible and take her for drives and have everyone ‘ooh’ and ‘awe’ after her. Elaine was known for her knitting, her spirit and vitality and her sense of self. She was a take charge girl who knew what she wanted and was willing to give everything of herself to ensure those around her had what they needed. She was taken too soon and will be deeply missed, but what amazing memories she left us with. Elaine is survived by her children; Sharon Mills, Barb (Bob) Cameron, Terry Anne (Sandy) McNaughton and Gail (Allan) Williams, grandchildren; Crystal, Christine, David, Devin, Spencer, Myles, Noah, Dawn-Marie and Jason, several great grandchildren, sisters; Janita (Ernie), Diane and Jeanne and brother Lloyd, along with several nieces, nephews, cousins and friends. In addition to her parents and husband, Elaine was predeceased by her brothers Lawson, and Gordon and her sisters Julia and Beatrice. Arrangements are entrusted to Fundy Funeral Home, 230 Westmorland Road (646-2424) where visitation will be held on Thursday from 3:30-5:30pm. A Celebration of Elaine’s Life will be held on Thursday, February 14, 2019 at 6pm from the Fundy Funeral Home Chapel. An interment in Ocean View Memorial Gardens will take place at a later date. For those who wish, memorial donations to the Palliative Care Unit, the Heart & Stroke Foundation of New Brunswick or to the charity of the donor’s choice would be appreciated by her family.